I like to do things besides write, and I know I’ve posted at least one picture of my sculptures before. I have more, and really intend to add them. But that’s for later. The above untitled piece is the beginning of my foray into printmaking. I created the original image by combining found sources in Photoshop and then transferring the etching to a plexiglass plate. The first two editions were in black ink, this and a partner piece in red. The entire effort is very process oriented and really requires you to be present. It’s very different from any other endeavor I’ve tried before. And a lot of fun. i really like this…it has that feel to it that it could be really old, the image something between pagan and something from Asia. Thanks. It’s not bad for someone who can’t draw. 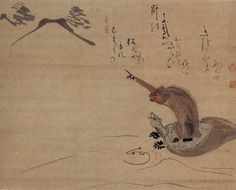 Was beginning re-reading the book Thoughts Without a Thinker, and in the preface the author mentions the Zen master Hakuin, who took up painting at the age of 60. Was looking at some of his work, and thought of your post. That’s awesome! Thanks for the comparison. I know I’ve heard his name, probably in one of the Zen koans I read years ago. I knew his name sounded familiar! I suppose I should mention he is considered one of Japan’s great artists. Thank you. It was fun to try something new. Very cool. Have fun with your new hobby. This is fantastic!! Where can I see more of your art? That’s pretty much it for printing. I just started taking a class. Looks like you’re off to a great start, then! I look forward to seeing more prints! And any other art you do. I post some more once I get some more done. Thanks again!